Nissan is accelerating plans for a European-wide Quick Charge (QC) network for electric vehicles by giving 400 new quick charging stations free of charge to EV charging operators. Strategically located, these new points will boost existing networks and give EV customers greater freedom and flexibility by effectively extending the range of their car. By recharging batteries in a fraction of the time usually needed this radical step will help drive more customers towards electric vehicles such as the Nissan LEAF. The advanced lithium ion batteries in Nissan LEAF can be recharged from 0 to 80% capacity in just 30 minutes using a quick charger. Although a range between charges of up to 175km will be enough for most Nissan LEAF owners, the spread of Quick Charger networks will allow drivers to travel longer distances in a day. Recharging a Nissan LEAF with a quick charger takes a little longer than it takes to refuel a conventional car and is significantly cheaper. The move follows an agreement between Nissan and five of Europe's leading utility and EV infrastructure supply companies to speed up the provision of the latest quick chargers developed by Nissan Motor Co., Ltd., which are cheaper - up to half the previous price - and smaller than before. The target is to have a network of quick charge stations across Europe with several thousand units in place by the end of 2012 and tens of thousands by 2015. To kick start this ambitious programme Nissan is now announcing it will give 400 units away to Zero Emissions Mobility partners and volunteering companies in Europe, all of which are enthusiastic backers of the company's ambitious electro-mobility plans. A selection process started on October 10th after which winners will be awarded chargers according to how they fulfill a strict list of criteria developed by Nissan. 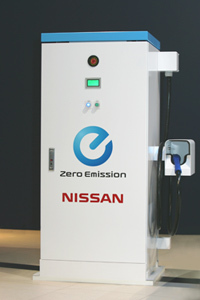 These include convenient and accessible charger location, installation starting February 2012 and free or discounted charging for all Nissan LEAF customers for at least one year. "With a significant number of QCs available across Europe, EV owners will be able to recharge quickly no matter where they go. 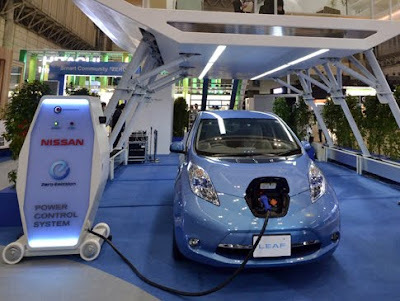 We believe this is essential for the mass adoption of EVs," said Pierre Loing, Vice President Product Planning & Zero Emission Business Unit, Nissan International SA.